These simple and affordable weekend projects will give your small garden a new lease of life. Did you know that your garden could add up to 20 per cent to the value of your property? Skyrocketing house prices are driving the demand for gardens, no matter what their size. 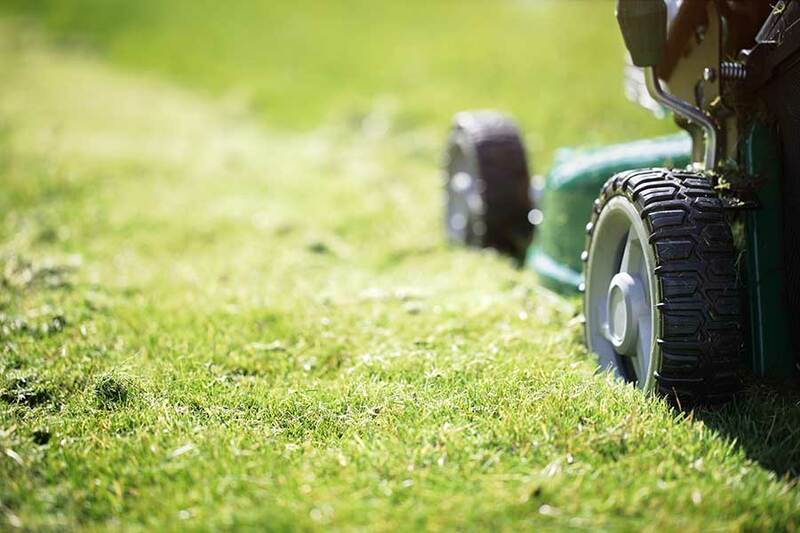 A poorly maintained garden can negatively affect a buyer or renter’s decision to use of a property and in the process and can decrease its value. A small garden can still feel like a big project, and it can be tough working out what will make the most impact. 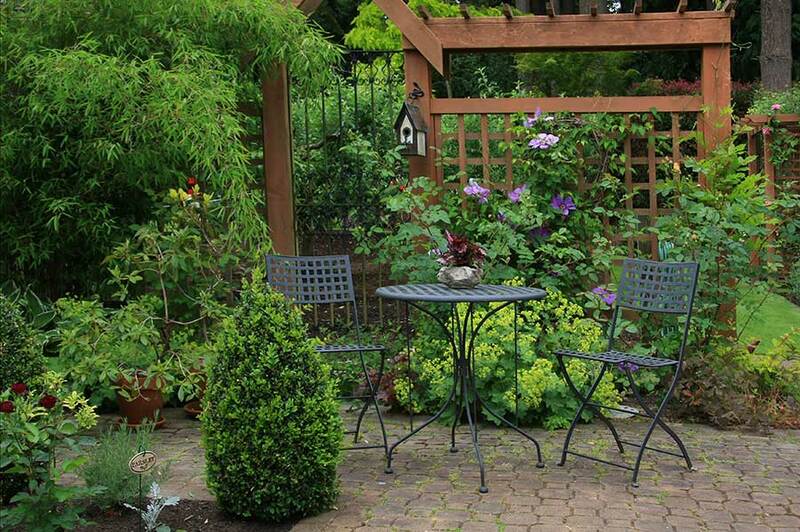 Use our small garden tips to get started giving your outside area a new lease of life. Simple steps sometimes have the greatest impact. So, set aside ambitious plans for a water feature or a herb garden and start small: get rid of litter, remove dead plants and mow the lawn. Then power wash your patio if it’s looking grubby and replace any broken or chipped tiles. If your fence is falling down, fix it, and if your shed is looking a tad tired, give it a fresh coat of paint. These tidying up tasks will make your garden look smarter in just a few hours. Injecting colour into a small garden wakes it up and makes it feel more welcoming. Why not liven up existing furniture with bright cushions designed to withstand rain or shine (Ikea and Tesco are good sources)? Then introduce cheap but chic patio pots and garden furniture for year-round cheer. You can also spruce up a dull garden wall with a lick of exterior paint, which is specially developed to help protect against weathering. If space is at a premium, stick to colours that have a brightening and lightening effect: think white, cream or pastel colours. And finally, with two bank holidays in May and the weather warming up, you’ll want to be prepared for al fresco dining. Funk up your outdoor dining table with super-chic picnicware; try the Danish brand Rice, which has made its name with colourful melamine. Take inspiration from this small urban garden, where a wall-mounted mirror makes the space look bigger. Just remember to position your mirror so it has something to reflect, such as a collection of pretty plants or freshly painted dining furniture. And beware: if there’s nothing much in your garden, a mirror can make the space feel more empty. 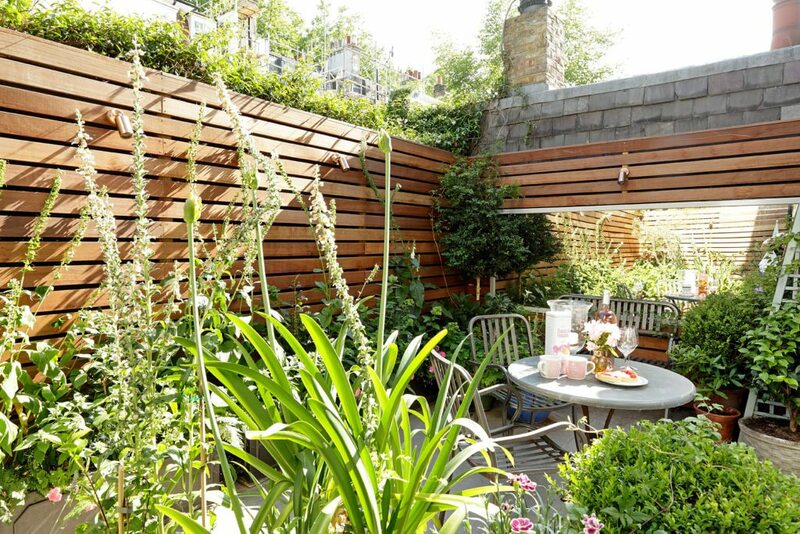 Cue & Co of London has used a mirror to increase the feeling of space in this small urban garden. 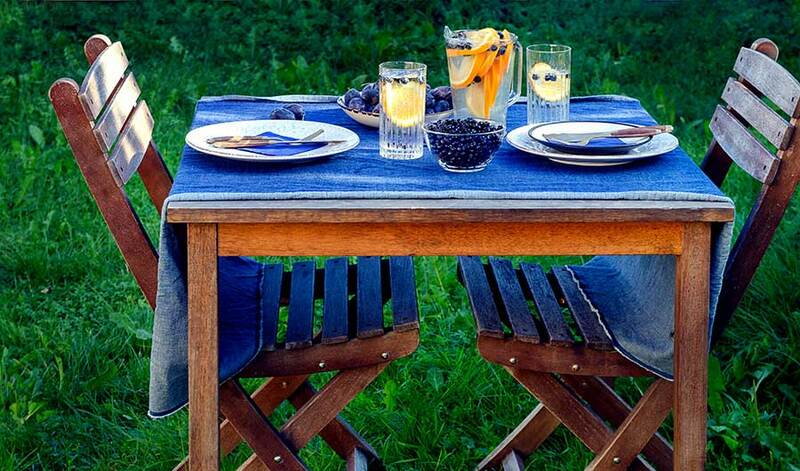 Your garden may be small but that doesn’t mean you can’t dine al fresco. A six-seater dining table is probably out of the question, but a bistro set with a slimline metal table and two fold-up chairs could transform the space and is easily stored when not in use. Furniture that serves more than one function is super-handy too. A bench with storage will earn its keep, for example, doubling up as a seat and a stash for garden accessories. Push it against the wall or fence in a bijou garden. Top small garden tip tip: aim to position furniture at the bottom of the garden to create the illusion that your space is bigger than it is. 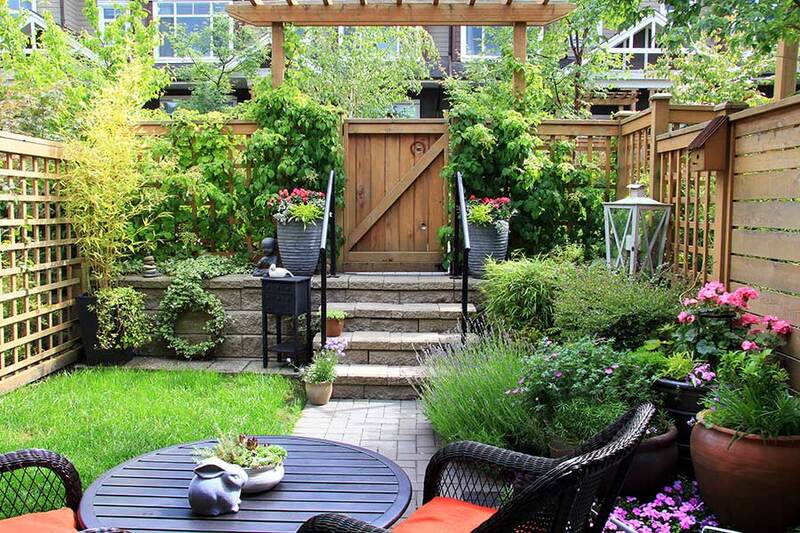 You don’t need a lawn – or even flower beds – to create a gorgeous garden. Pots filled with your favourite flowers and plants are a simple and manageable way to introduce colour and bring some of your personality to the space. If you don’t have green fingers, shop around for ready-planted pots that contain a selection of plants that look great together. Then all you need to do is choose the perfect spot in your garden to show them off. 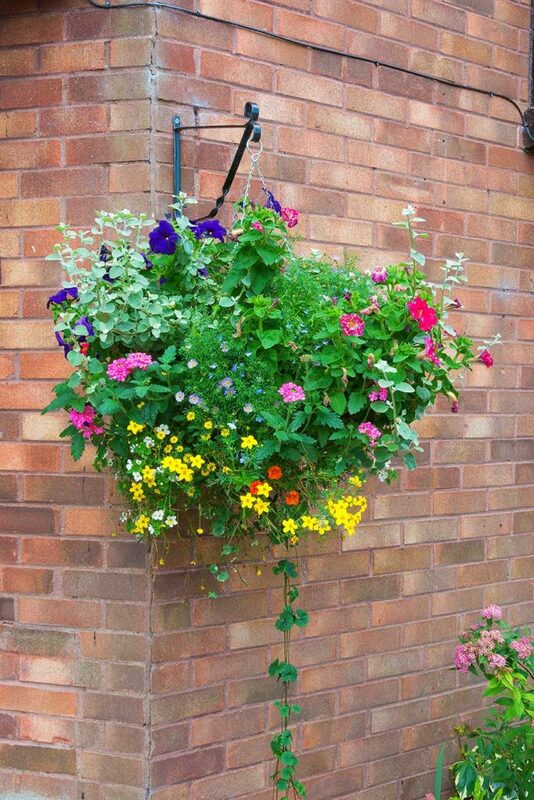 If space is really tight, look at hanging baskets: they don’t need much space and can be planted according to the season, so you don’t need to ditch them during the winter months. They can look a little shabby if they’re out all year round, so make sure you replace them regularly or clean them if they’re made of pottery. Don’t forget to repaint the brackets and the chains too. A trellis can be picked up for as little as £15 at Wilko and provides the perfect growing space for climbing plants. Plus, when walls are covered with sweet-smelling roses and climbing hydrangeas, you instantly draw attention away from the size of your garden.